I glued the cat on the plate with some extra strong china glue. Doesn't this look fantastic ? 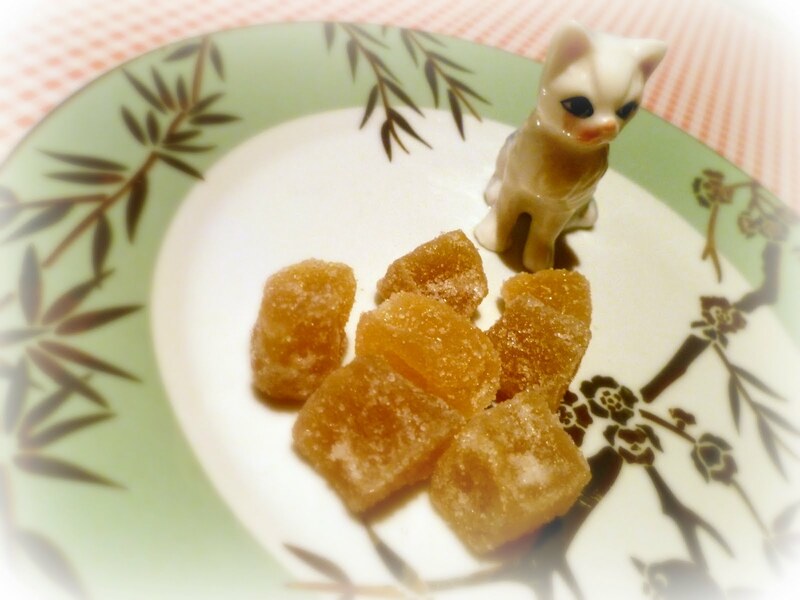 A cheap (bought the plate on sale) and unique (vintage cat) way to amaze someone you love and like to share your best sweets with ! I really love ginger. In any form. I can drink it hot or cold, mixed in a lemonade. Just love to eat it with sushi - or use it in a dessert like crème brulée or milk. You can cut these crystallised ones up in tiny pieces to mix in a fruit salad. Or give them together with some dark chocolat when your gossip girlfriend comes over for a coffee. The ones I like best are the ones I found at Waitrose (in Cyprus haha !) but I bet any self respecting candy shop offers them too in their candy and sweets collection. What's your best ginger recipe ?